I think it would be safe to declare the diasporic collaborative party effort a complete and total success. It honestly could not have gone a single bit better than it did. I mean, people could have eaten more food so I wouldn’t have as much still in my fridge, but overall, it was awesome! After getting not-quite-enough sleep, I awoke early Saturday morning to make the trek down to TO. We actually left within 8 minutes of our scheduled departure time, which is both FABULOUS and very unusual and encountered almost no traffic, which was sweetness in itself over the four hour drive. Since it was my mom’s 50th, we had a few surprises up our sleeves….the first of which was a photo shoot of the kids. So…..we had kids from O-town, Cornwall, Creemore, Burlington, Port Franks, etc. all gathering at a rather randomly selected park on the shores of Lake Ontario. Not only did almost everyone show up on time, but the pictures came out fabulous. My super talented hubby took about 120 pictures of us, almost all of which were great. Now, the extra-fun challenge was getting nine of these pictures from RAW format into printed format, to be placed in the pre-purchased frame we wanted to give my mom later that day. While, hubby drove, I balanced the laptop (aka portable photostudio!) on my lap to both copy and go through pictures……in record time, my cute hubby adjusted and converted them (not while he was driving!) and we had them printed at the friendly neighbourhood Loblaws. Slightly funny story – while we were sitting in the parking lot, trying to shield the laptop screen from the glaring sun (so we could actually SEE the pictures), we saw a rather unusual sight. There was a gaggle of Canada Geese (you know I’ve always wanted to use that word, eh?) kinda hanging out in the road leading into the parking lot. They seemed a rather conniving bunch….just standing there, watching traffic. I suspect conspiracy, because no sooner was there a break in traffic, when these fat fowl waddled their way across the road….effectively blocking traffic. They strolled and strutted their way across the road, oblivious to the honks and fists shaken in their direction. No sooner had they reached the other side, than they moseyed on back across the road, ticking off an entirely different group of drivers. The hilarious part was that one guy was obviously more into it than the others, because long after the others stopped, he continued to just hang out midroad, honking and hissing at those who dared question his presence. So the answer to the question – why did the Canada Goose cross the road? Because he had nothing better to do and it seemed like a good idea at the time….for all I know, they’re still there, having a blast. And for my non-Canadian readers (of which there are a surprising lot – super cool! 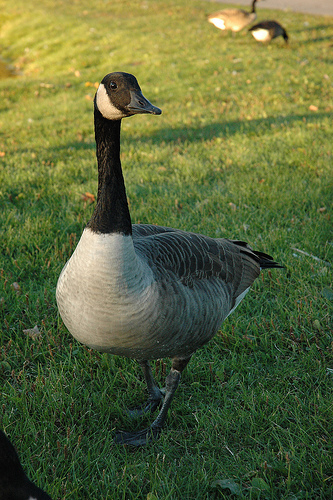 ), here is a picture of a reference Canada Goose….they are a very large bird and more like a pest than anything in cities. They take over parks and make a nasty mess of everything…. Anyway, hubs and I dropped off nine pictures, all of which you can actually check out on my flickr account here - PICTURE LINK! THEN, we raced to the chosen restaurant to meet everyone else for an early dinner. Al Dente and their staff did a bang up job of serving the dinner. The food was wonderful (Italian style – not like you could have guessed it from the name…..) and I can’t say enough good things about how helpful and gracious and patient their staff was. Pickering readers – if you’re looking for a good option for a group dinner (or even a romantic evening), this place is great. As for prices….um…..I can’t comment, because I don’t know…..but the food was great! My brother’s girlfriend Megg did an amazing job putting together a slideshow full of pictures and after dinner we headed back to the house for food and prezzies (and of course, hubs had to deke out to go pick up our hopefully-printed photos and arrange them in the frame). One of the funniest parts of the whole surprise was the food set-up. My mom, being a rather sharp cookie, knew that something was up. She didn’t know that hubs and I were coming up, and she didn’t know about all the people who would be at the restaurant, but she knew that such a great milestone could not pass by unnoticed. She also didn’t know that all these people were invited back to the house afterward (her house) for snacks and general good cheer. As soon as Megg and I got back to the house, we started ‘operation food bomb’. I brought in my cooler from the car and my mom’s jaw just dropped. As soon as I opened it and started pulling out tasty snack after tasty snack, she absolutely couldn’t believe that we had brought all the food you could conceivably imagine for a party. And if you think I’m bad….Megg was WORSE. My own jaw dropped when I saw what Megg brought up from the basement fridge (proclaimed off-limits to my mom the day before)……that girl probably baked like 7-8 different types of squares (in massive, massive pans), including two kinds of cheesecake, lemon squares, cookies, you name it, she had made it. I think we could have fed 50 people for a week. We whipped back to O-town the next morning (not as early as we would have liked, due to somewhat over-imbibing on the aforementioned good cheer) and rushed around to clean the house for my dad’s arrival last night. Sadly, we discovered that our ailing thermostat had finally kicked the bucket and we couldn’t get the furnace to come on when we got home. Though the weather has been unseasonally warm, it also bears mention that my dad was accompanied by his lovely friend Pim, visiting Canada for the first time from Thailand. So the house REALLY needed to have heat. We zipped out and found a new programmable thermostat (so much for failed attempts to join the Peaksaver program and my (again) multi-talented guy got the house to a toasty temperature in record time. Hubs made us his spaghetti creation for dinner (thoughtful sweetie that he is, letting me spend some time with my dad, whom I hadn't seen in months! ), served with Caesar salad, garlic bread and red wine. Yummmy! Tonight, Pim is going to make some sort of thai creation for us, which I know will be awesome. Thai food totally rocks!!!!!! Will chat with y'all later. Thanks for reading and I, in turn, love reading any thoughts or comments you have. Woah! I'm exhausted just reading about your weekend. Congrats! It sounds like it was a wonderful time and an absolute success. Your mom must have been thrilled with her surprise party…so thoughtful! Great pictures. Your hubby is a talented photographer and I love your red coat! Glad all went well for your mom's 50th! Geese are common at my school (Universiity of Waterloo). They can spend hours trying to cross the road. It's quite funny to watch!